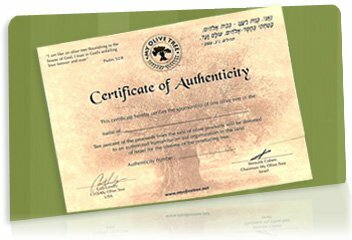 The My Olive Tree Certificate of Authenticity is a beautiful 10×13 piece suitable for any home or office. The muted colors make it versatile while the rich gold embossed text adds a sense of elegance and importance. We feel it is a wonderful way to display your demonstration of love for the people of Israel. Your certificate is signed and includes a unique certificate number. 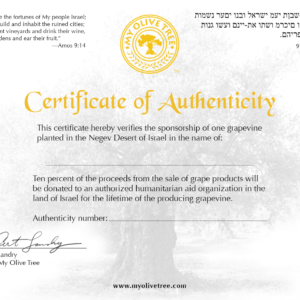 NOTICE: This item is included with your tree sponsorship. To purchase this product by itself, means you need a replacement certificate.